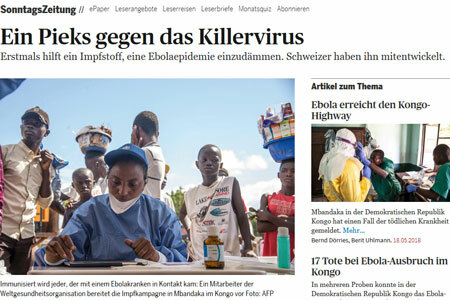 President of the research council of the Swiss National Science Foundation and former ISPM director Matthias Egger, who was involved in the successful trials of the vaccine that began in late 2014 in Geneva and then in Guinea, explained the historic nature of the vaccine and its rapid deployment to contain the recent outbreak in the DRC to the Sonntagszeitung. Read the related publication «Efficacy and effectiveness of an rVSV-vectored vaccine in preventing Ebola virus disease: final results from the Guinea ring vaccination, open-label, cluster-randomised trial (Ebola Ça Suffit! )».